In recent years there has been a proliferation of publications – across a range of disciplines – which have the working-class home at their centre. These works have questioned our approach to the working-class home through both a re-reading of traditional sources and a utilisation of previously overlooked archival evidence that grant unprecedented access to these homes. New interpretations have begun to overturn our previous understandings of the working-class home and its inhabitants. Moreover, those exploring the working-class home are now moving beyond the experiences of city slum dwellings to examine a much broader geographical, socio-economic, and ethnically diverse working class and the wider range of dwellings they inhabited. This interdisciplinary one day workshop will bring together academics (postgraduates, early career researchers, and established scholars) from across numerous disciplines – History, English Literature, Art History, Archaeology, Geography, and other disciplines – as well as archive and museum professionals to discuss approaches to exploring the working-class home. 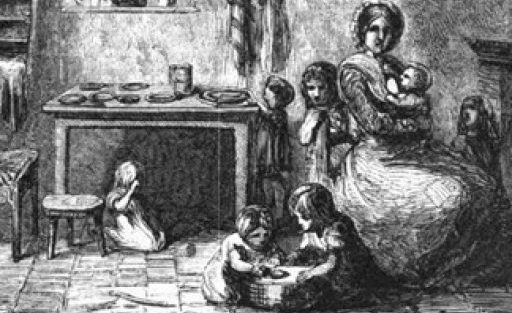 ‘Domestic life and material culture in the homes of the English poor, 1770-1834’. Napoleons and Venuses de Milo’. ‘From Glass Case to Kitchen Table–Uncovering the family stories within the recreated working class houses at the Black Country Living Museum, Dudley’. ‘No More Shared Hallways—Dublin’s social housing as tenement ghosts’. ‘“Inexpensive but not cheap”: methodological challenges of wallpaper in working class interiors’. ‘Subletting and lodgers: ideals and realities in the small terraced through-house in England, 1865–1914’. ‘“Slums” and the Sanitary Inspectors—the interwar period 1918-1939’. ‘Can domesticity be found on board a ship or in the forest? How to research the everyday practices and homes of Finnish sailors and logging workers’. ‘From Staffordshire to Salt Lake—Recreating an English Home in the Desert’.